Pangy Day was conceived by a group of students who wanted to recreate the spirit of the forgotten tradition of May Day—during which students arranged numerous theatrical productions and elaborate pageants on Prospect Hill—as well as the enthusiasm felt on campus during President Elizabeth Topham Kennan’s ’60 inauguration, two years earlier. 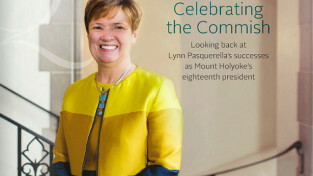 When Mary Lyon refused to have the institution named after her, one of Mount Holyoke’s founding trustees, Edward Hitchcock, suggested naming the seminary “Pangynaskean,” compounding three Greek words meaning “whole woman making.” The name was met with much derision on all fronts. In 1980, students re-adopted the name as part of a new celebration they were planning. The first Pangynaskeia Day on April 25, 1980, featured a parade of dozens of marching units and floats, lectures and presentations by faculty and alumnae, an all-College picnic, softball, volleyball, Frisbee games throughout the campus, and songs and entertainment in the Gettell Amphitheater. 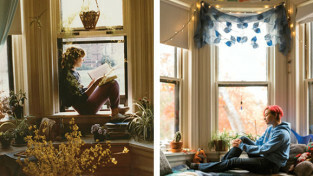 The highlight of the inaugural celebration was the afternoon parade, during which scenes from Mount Holyoke’s past, present, and future were depicted by various student groups from across campus. 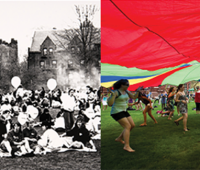 Today, Pangy Day is much less structured and begins with the traditional all-College picnic on Pageant Green, the one Pangy Day event that has held up through the event’s various iterations over the years. After a “fun free-for-all,” which includes music, games, face painting, and ice cream on Skinner Green, the climax of the day is the ritual maypole dance, resurrected by the Pagan/Wiccan Collective in 2001. Also in the spirit of the May Days of yore, all participants receive daisies, handed out by the Environmental Action Coalition. 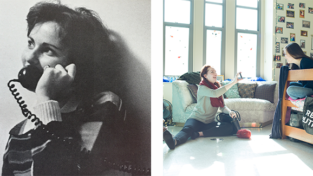 In recent years, organizers of both Pangy Day and Earth Fest have collaborated, and now the day incorporates a celebration of the environment as well as the history of the College and its traditions. Some of the newest free- for-all offerings reflect this collaboration: the Pangy Day Thrift Store—a “mega free bin” full of donated items; a shredding event, at which personal documents are shredded for a small suggested donation that goes toward replacing trees on campus; parachute play; and locally raised bunnies available for petting and stress relief as students prepare for final exams looming on the horizon. This article appeared in the spring 2015 issue of the Alumnae Quarterly.